In this lesson we’re going to take a look at some blues bass line ideas using the Mixolydian mode and major pentatonic scale (Mixo-Pentatonic). These are some common sounds that you hear in a lot of traditional blues bass lines. Before I get into the music theory and scales shapes, here’s a performance of the entire blues bass line. Here’s the bass tablature for the blues bass line. You can download and print out the tablature for this lower on this page in the “Bass Lesson Downloads” section. Here we will take a look at the music theory and scales that make up this blues bass line. The first scale that’s used is the Mixolydian Mode. The Mixolydian Mode is build from the 5th degree of the major scale. So an A Mixolydian mode is build from the 5th degree of a D Major Scale. A basic blues in the key of A is made up of 3 chords. A7(I), D7(IV) and E7(V). So you will use an A Mixolydian over the A7 chord, D Mixolydian over D7, and E Mixolydian over E7. Bass Foundations – 4 Fret Bracket Approach Workshop. The Mixolydian Mode contains 7 different notes. Pentatonic scales contain 5 different notes. 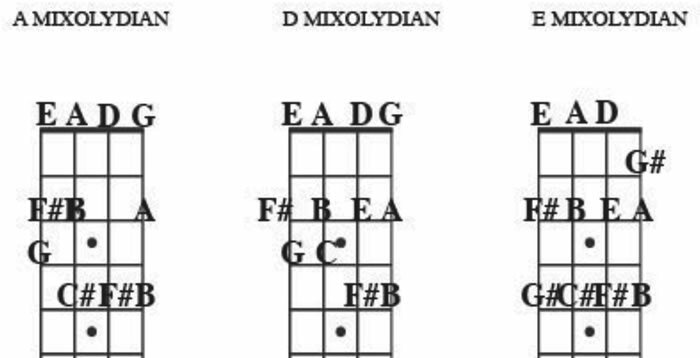 If you take away the 4th and 7th degree away from the Mixolydian Mode you get a Major Pentatonic Scale. Or what I sometimes call a Mixo-Pentatonic in this context. 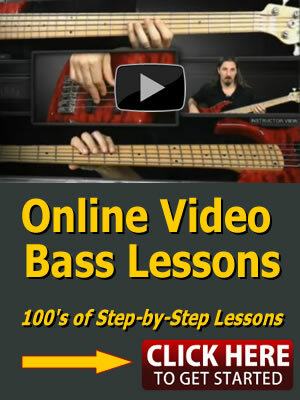 This part of the video bass lesson will take you step-by-step through how to play this blues bass line. Be sure and check out the sister bass lesson to this one called “Dorian Pentatonic Blues Bass Line Ideas“. How to play fun great sounding slap bass lines following a step-by-step system.